A wine steward not only knows fine wines, but he tends to have a sense of which wines complement which meals. If you want an interesting career which could bring you close to the rich and powerful people of the world, perhaps a career as a wine steward is right for you. Also known as a "sommelier," a wine steward is an expert connoisseur of fine wines, who is solely responsible for developing the wine list and approving wines for the finer restaurants of the world, as well as other posh locations. They tend to be elite in their craft, and a drinker of fine wines themselves. But they seem to possess both a natural ability and a formal technique for determining which wines are the best. The wine steward needs to be someone who loves fine wines, and the finer things of life, and has a preference toward and appreciates exceptional quality. Customers of fine restaurants learn to trust the wine steward to provide them with the very best and they often also expect them to keep some of their own favorite wines on hand to serve with their favorite meals. A wine steward not only knows fine wines, but he tends to have a sense of which wines complement which meals. An excellent wine steward complements the chef nicely in a fine restaurant and knows how to blend his wines with the elaborate meals the chef prepares. A wine steward or sommelier may come from any background or education, as long as he possesses a desire to work in the wine industry and is passionate about good quality wines. One site compares the good sommelier to a sort of "matchmaker," who is in the search for finding the perfect match of wine for the right customer. He is a lover of wines, but also a pleaser of people. The typical education would consist of taking the sommelier certification exam and passing a blind wine-tasting test in front of a panel of judges. Therefore, it is important to know your wines and be able to tell the differences between them by smelling and tasting alone. TLC has some information on how to get the proper training for this interesting career. 1) Get some education in the culinary arts. Even if you do not need a degree or culinary arts certificate to be a wine steward, the environment you will be working in may include fine restaurants and wineries. For this reason, it is a good idea to take some coursework in the culinary arts field, so that your experience and expertise will be as diverse as possible. 2) Consider coursework in the Hospitality field also. Being a wine steward or sommelier is a hospitality career, due to the degree of contact with the public and customer service. You would often be requested by some of the best paying customers of an establishment to show them the wine list or to recommend a fine wine for their special occasion or dinner. So, the better you do with people, the more respected you will become as a wine professional. 3) Taste wines often-but not TOO often. A wine steward is an expert at wines. But they are not a "lush." Do not mistake an expert wine taster for someone who does not know how to hold their liquor. Taste different wines regularly, but remember that you are a professional. And professionals do not get drunk on the job, or develop a reputation for overdoing it. Be professional. 4) Develop a portfolio of fine wines you have recommended or tasted. Carry a wine list that you know well with you to potential employers, so that they can see your experience is diverse. Act like a consultant, because that is what you are. If you have a list of wines handy, employers of fine establishments will know you have your act together and know your stuff. Recommend a fine wine for your potential employer, based on their personality or personal tastes. 5) Develop relationships with wineries and vineyard owners. In order to climb the ladder of success as a wine expert, it is important to deal with vineyard owners in a positive way. Stop by their facilities or vineyard and sample their grapes and their product. Let them know you are a sommelier and would like to consider featuring their wine in a well-known restaurant. This is a dream come true for many vineyard owners and they will gladly oblige. And it gives you a supplier for later, if you set up your own restaurant or serve as the buyer of wines for a restaurateur. If you are serious about becoming a wine steward, start today by enrolling in a program in the culinary arts or similar field, or start studying for your certificate as a sommelier. Here are some of the qualifications and duties you will be expected to perform. If you are an expert at wine, and want to help customers have a great experience with this in their favorite restaurant, look into this interesting career. 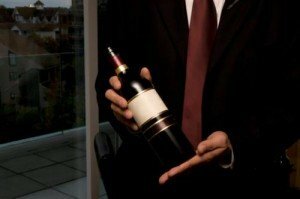 Fine wines tend to attract the rich and famous and tend to reside in the more affluent establishments around the world. Who knows? You just may serve Donald Trump his next bottle of wine at a corporate dinner. Have fun!